*Each shell is loaded with one steel BB. 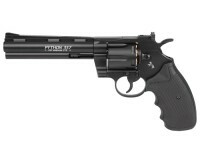 One of the most desired revolvers is now available as a CO2 BB gun. You can tell a lot from our pictures, but just wait til you pick this up! You'll swear you're holding the firearm. The working ejector rod, the use of cartridge shells, the full barrel underlug and swing-out cylinder really bring this to life. Some of the greatest gun writers/historians have described the Colt Python as the "Rolls Royce of Colt revolvers" and "the best revolver in the world." They're right -- and now you can own this same handgun as a BB gun. 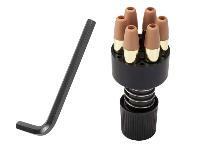 You'll want to pick up extra cartridges and maybe an extra speedloader so you can load up before you go to the range. 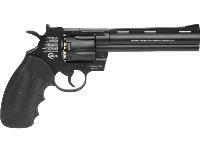 The Colt Python CO2 BB revolver is compatible with Dan Wesson brand revolver shells, however you will notice a drop in velocity due to the smaller size of the Dan Wesson shells. Things I liked: Love it. It is so realistic one for one spec replicated. 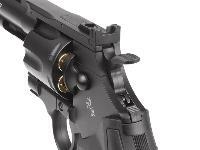 The rear sight is solid and responds to corrections. The double action functions well with a little practice. The fit and finish is excellent. 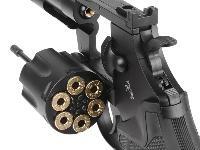 It groups well two hand hold single action. What others should know: Remember it is a revolver so make your six rounds count. Im used to semi autos with many rounds. 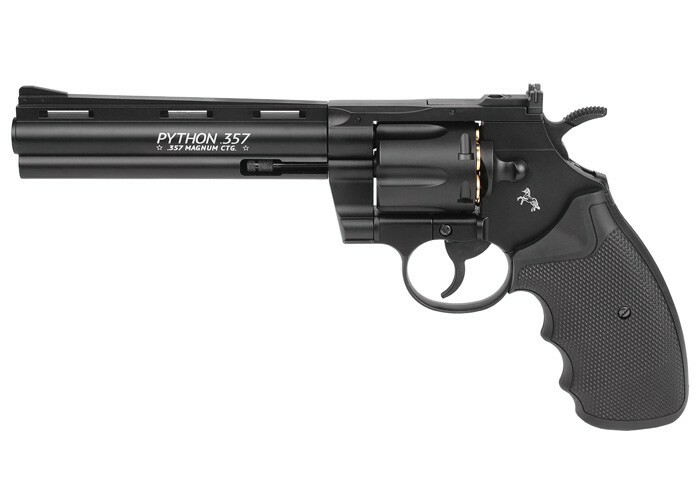 Things I liked: The revolver I received was well fitted with much tighter tolerances than the Swiss Arms 357 I had bought previously but from the varying reviews for both the Colt Python and the almost identical Swiss Arms 357, that may not indicate that the Colt is superior to the Swiss Arms revolver as a rule. It was in the case of each one I received but there is more to tell later. I had determined not to buy the Colt due to the bold, white-lettered paragraph placed on the right side of the frame. This kept the rating down as the graphics designer who did this should find work elsewhere as this is a horrendous scar on an otherwise very attractive revolver. It was the presence of the "raging colt" emblem on the left side that persuaded me to go ahead and buy the pistol; that and a sale where I got it for a big, big savings. 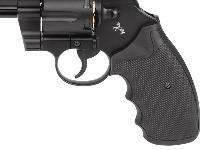 I also wanted it to make a direct comparison with the Swiss Arms 357. My review on that product can be found in its product reviews if you want the full story. Things I would have changed: Obviously, the paragraph on the right side would be deleted as it is not found on the Swiss Arms which is far more attractive on that side. Other than that, quality control of each one. The one I have is almost as it should be, and very nicely fitted. 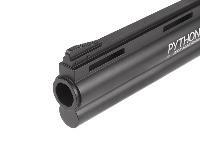 It has no slop in the fit of the barrel shroud into the frame. The cylinder had some play in its fit onto the crane, but none too excessive as the Swiss Arms had. I did replace the spring in the windage of the rear sight as it was too weak and the blade was not consistently positioned in the sight body. The Swiss Arms had the same problem. I also would omit the safety found at the top of the grip frame just behind the hammer. This is a ridiculous feature. First, in the operation of the revolver it will not fire unless first cocked (in which position the safety can not be engaged) which itself serves as a safety! Otherwise, a long fairly heavy pull of the trigger is required. The safety will prevent this action but why the need? What others should know: The Safety could be easily moved by a child who would have a difficult time pulling the trigger or cocking back the hammer. In any case, this is not the purpose of the safety as preventing access to the gun is the remedy to that.Both the Swiss Arms and the Colt are identical in every aspect except for the markings of the individual makers. You could tear them both apart and randomly assemble a revolver with some parts from each one. With the price difference of the two, I wanted to see for myself. 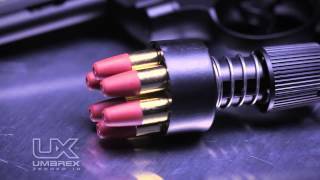 Quality varies from one gun to the next in each brand and overall would likely equal out. Yet at current pricing, one is $40.00 more than the other. I just had to have the Colt because it is the real deal Python and I wanted it to read as such and to have the rampant colt emblem. No regret, just letting others know if that doesn't matter to you and you get a lucky draw of one of the better made ones, you can save $40.00 and have the exact same gun. My Swiss needed work; the Colt did not. Things I liked: I like the feel and the look of the revolver. It was sighted in pretty accurate at fifty feet. After that, need to make adjustments. Get about 80 shots on CO2 cartridge. Things I would have changed: Add an extra set of cartridges. Can it shoot .177 darts and not just pellets? Aside from graphics I'm truly stumped to find a single difference between this and the Swiss Arms 6 inch - however the stats for that claim a 6 inch barrel, while this states 5.5 inches. Can some one get me an accurate dimension please? You CAN use Wesson shells but I wouldn't bother. The diameter is so different the performance of the gun is awful. Stick to the Colt shells, TRUST me! !